In this time of such a rapidly-changing environment, people with full-time office jobs and a modern lifestyle people are often exposed to high levels of stress. Nowadays anxiety is a normal part of life — everyone can be a bit nervous before an important meeting at the office or taking an exam at the university. But for a person who suffers from an anxiety disorder, things are different; this person feels anxiety all the time, and it doesn’t go away. According to the National Institute of Mental Health, each anxiety disorder has different symptoms, but all of the symptoms center around excessive, irrational fear and dread. Anxiety disorders can arise from alcohol abuse, and it is very important to treat other problems before treating a person for anxiety. Otherwise, they may not respond well to the treatment for anxiety. In 2014, the lowest percentage of adults reporting poor mental health in the United States was recorded in South Dakota: 27.3 percent. Texas had the second-lowest percentage (28.9) of adults reporting poor mental health. The rates of adults reporting mental health problems were almost the same in the next two states, Kansas and Virginia (29.3 and 29.4 percent respectively). In fifth-place Nebraska, 30.2 percent of adults reported poor mental health in 2014. On the opposite side of the coin, we should also examine the states with the highest percentage of adults with mental health problems. At 39.1 percent, Illinois led the country in percentage of adults reporting mental health problems. Oregon had a quite similar rate of 39 percent. 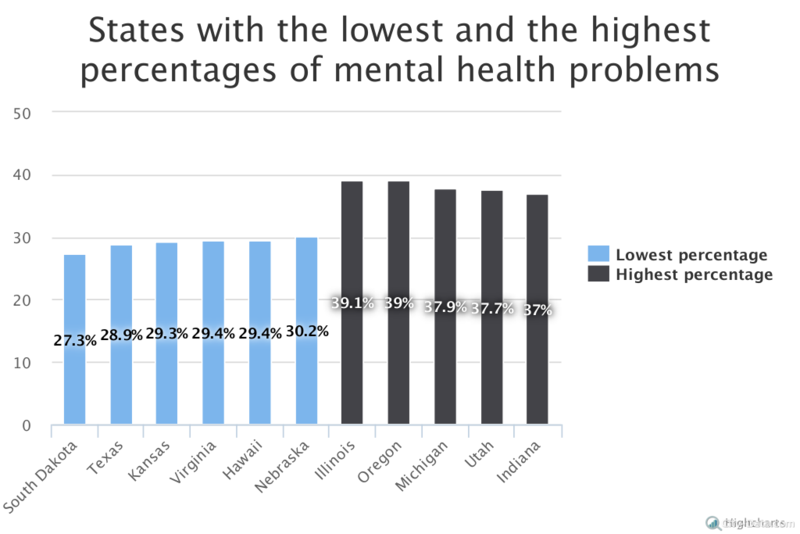 Michigan took third place, with nearly 38 percent of adults reporting poor mental health. Utah had the fourth-highest rate in 2014 (about 37.3 percent). Indiana rounded out the top five at 37 percent. 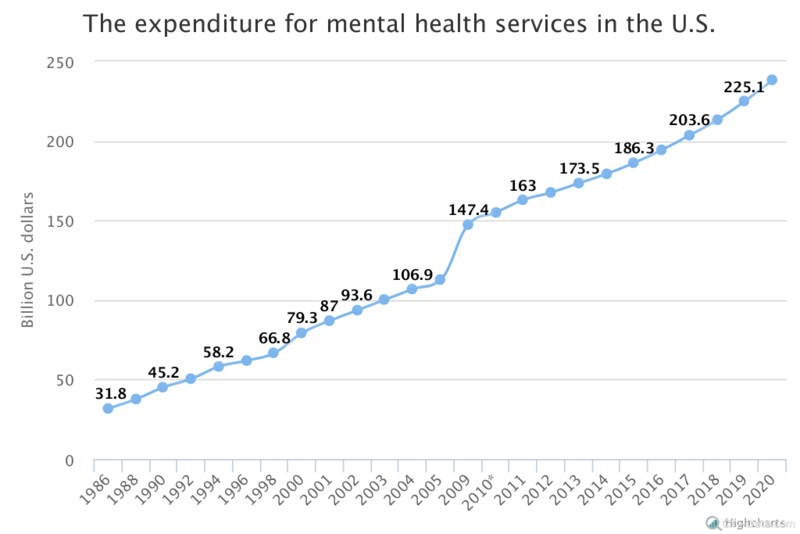 Expenditures for mental health services in the United States have been increasing yearly since 1986. To provide exact numbers, the United States spent only $31.8 billion on mental health services in 1986. By 2010, expenditures had risen to $155 billion. According to the forecast published by Statista.com, our country will spend about $194.4 billion by the end of this year. Furthermore, expenditures are expected to rise rapidly in the next couple of years. Thus, the expected spending on mental health services is $203.6 billion in 2017 and $213.3 billion in 2018. By 2020 the United States will spend about $238.4 billion to help people with poor mental health. According to a survey regarding the prevalence of anxiety disorders among adults between 2008 and 2012 by gender, about 8 percent of women and 3.2 percent of men suffered from one or more anxiety disorders. During the surveyed period, about 2.7 percent of women and 0.4 percent of men had a specific phobia. 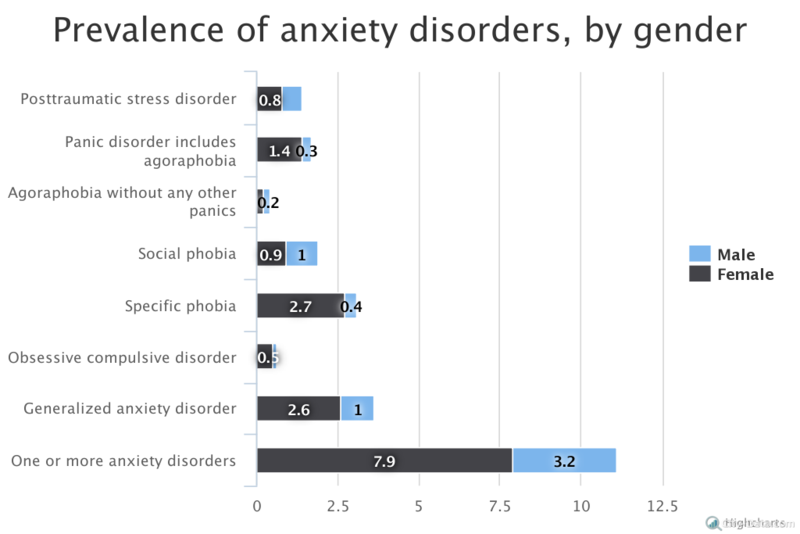 Generalized Anxiety Disorder afflicted 2.6 percent of women and 1 percent of men. Heres my solution- see a doctor and first of all, get blood levels of vitamin D drawn. Especially if you live in cloudy northern states. Vitamin D is almost always low and it effects the emotions and mind among other things. People don’t drink vit D milk anymore, they wear sunblock all the time- no vitamin D is made by their bodies. If its not that, see about getting some medicine for depression or anxiety. There is no value judgement to sometimes need some help for mental or emotional problems. It is just a chemical imbalance like diabetes or something.